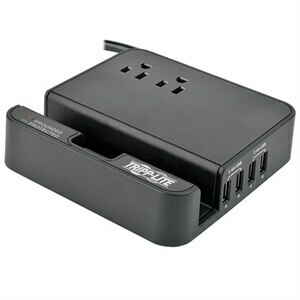 Tripp Lite's TLP26USBB Personal Desktop Charging Station provides exceptional convenience for daily charging tasks. Perfect for home, office, workstations and dorm rooms. With 2 AC outlets for safe power and 4 USB port with 4.8 amps of total power, this charging station can easily handle multiple devices. The built in slot can hold your tablet or phone for hands free viewing while charging. TLP26USBB Personal Desktop Charging Station offers 2 total outlets, 6 foot cord, 4 USB charging ports for a total of 4.8 amps, and diagnostic LED to warn of suppressor damage. AC suppression rated at 1080 joules shields equipment from surges and line noise.